Description: The title refers to your shapeshifting abilities. 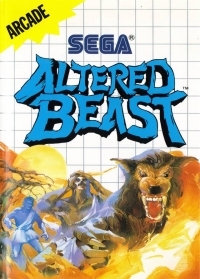 In this platformer, you can collect spirit balls by defeating two-headed wolves, allowing you to mutate into different beasts such as a werewolf, a dragon, a tiger, a bear and others depending on the version. Each form, tied to a level, comes with special abilities such as flight and powerful attacks, easily superseding the basic set of punches and kicks in your human form. Box Text: You were a Roman Centurion. You died bravely in battle. Now, a hundred years later, you have been called back from the grave by Zeus, God of Thunder. Even as he grants you new life he gives you a mission. You must rescue his daughter Athena from the evil clutches of Neff; Lord of the Underworld. But in this life you been given an edge...the power to transform into magical beasts of awesome power! From a man to a superman...to a werewolf, were-dragon, were-tiger and the ultimate...a Golden Wolf! Each form has supernatural abilities. You'll need them all...for Neff is a fearsome enemy. Fail, and Athena's fate will be unspeakable. Win...and you take a place in the Pantheon of Immortality! Remember...Never say die! 01-28-2016 Flashback2012 Box Text You were a Roman Centurion. You died bravely in battle. Now, a hundred years later, you have been called back from the grave by Zeus, God of Thunder. Even as he grants you new life he gives you a mission. You must rescue his daughter Athena from the evil clutches of Neff; Lord of the Underworld. From the surface to the very heart of the Underworld you must journey, fighting Neff's undead army every step of the way! Zombies, demons, gargoyles, three-headed Wolves. But in this life you been given an edge...the power to transform into magical beasts of awesome power! From a man to a superman...to a werewolf, were-dragon, were-tiger and the ultimate...a Golden Wolf! Each form has supernatural abilities. You'll need them all...for Neff is a fearsome enemy. Fail, and Athena's fate will be unspeakable. Win...and you take a place in the Pantheon of Immortality! Remember...Never say die! 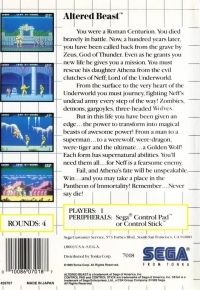 This is a list of VGCollect users who have Altered Beast in their Collection. This is a list of VGCollect users who have Altered Beast in their Sell List. This is a list of VGCollect users who have Altered Beast in their Wish List.